We were the least likely candidates to become enthralled with a dog, until our family adopted Lola last spring at the OC Humane Society in Huntington Beach. She’s a one-year-old black lab/cocker mix who has brought us more happiness than we ever expected. And we’re thrilled that we found out about Dogtails-Dog Shampoo, a gentle shampoo made with essential oils founded by Ali Lazar, a former fashion stylist to the stars at Barneys New York and Orange County native. 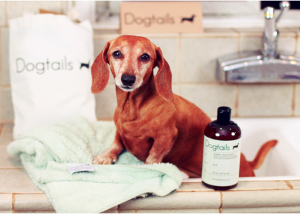 The exclusive Dogtails shampoo is gentle, free of harsh chemicals, and it helps restore natural shine. Lola is living proof that it works, she’s the shiniest and smells like chamomile and citrus, not medicinal shampoo. The shampoo is packaged in PET recyclable bottles, and even better, when you purchase a bottle of “Dogtails-Dog Shampoo,” a dog in need at an animal shelter will receive a soft blanket donated from Dogtails. Looking for the perfect dog gift? The Dogtails Bundle is a great value; it includes a recycled cotton mini tote with one full size bottle of Dogtails - Dog Shampoo (16 oz.) a comfy buttery soft Dogtails - plush microfiber towel, total cost $32. For more information and to purchase online.